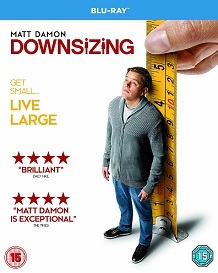 It’s time to get small and live large, as Matt Damon stars in the hilarious and original comedy, DOWNSIZING. To celebrate the digital, DVD and Blu-ray™ release coming up on May 28th, we are giving you the chance to win a copy of the action on Blu-ray™! When scientists find a way to shrink humans to five inches tall, Paul Safranek (Academy Award winner** Matt Damon) and his wife Audrey (Kristen Wiig) decide to ditch their stressed out lives in order to get small and live large in a luxurious downsized community. Filled with life-changing adventures and endless possibilities, Leisureland offers more than riches, as Paul discovers a whole new world and realises that we are meant for something bigger.